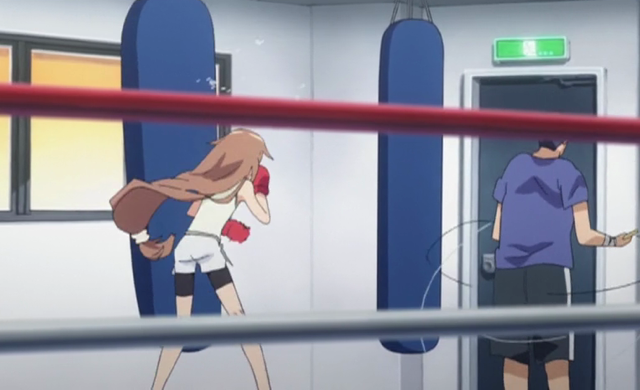 Ryouko Ookami trains at the gym. One of the most important aspects of this episode was the development of the main couple, Ryouko and Ryoushi. There are three parts to this development, psychological, as a couple, and power-ups. While Ryoushi sees a little psychological development (or as some have phrased it, he finally “manned up”), Ryouko gets the most, including a dream-like sequence in which she is confronted by a younger version of herself. 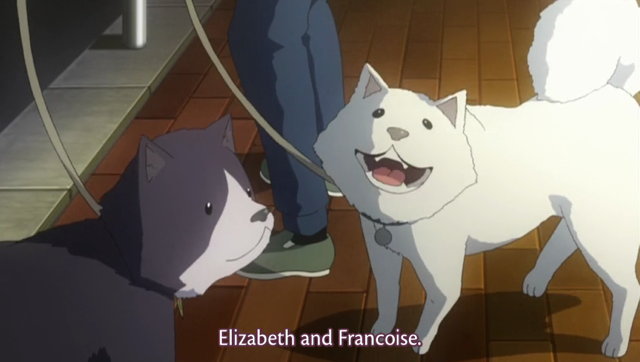 As a couple we see several developments, especially Ryouko’s realization that she and Ryoushi work well together as a team, and the times that Ryouko and Ryoushi get to share together, bonding over the dogs. Both Ryouko and Ryoushi get a power-up. As to the power-ups, both of the leads got new or improved weapons! I mentioned last week that I was surprised by a nice little fight sequence at the end. Apparently the fight scenes are a big part of this show. Maybe the genre is actually fighting-romantic-comedy-school-life-fairytale-parody. The one thing that disappointed me with these weapon upgrades is that they were apparently made by Majolica, but they didn’t really give her the mad scientist/Q scene that she obviously deserves. The Kiriki cousins featured in the ED. In addition we got a little more info on some of Ryouko’s companions, Urashima, for example, is a womanizer who doesn’t want to have anything to do with other men. More interesting to me, was the development of Liszt Kiriki, the president of Otagi Bank. 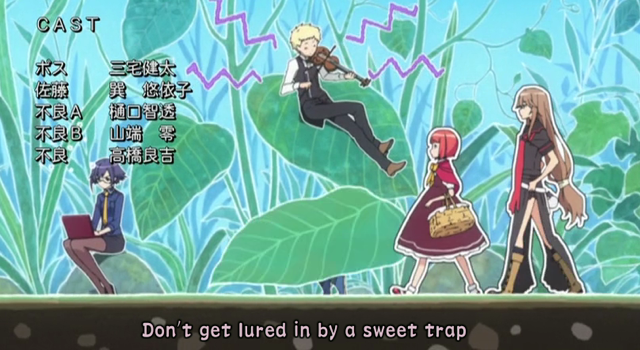 As can be seen from the screenshot above (taken from the new ED), the two Kiriki are juxtaposed as productive (Alice) and just fiddling around (Liszt). In the ED, the contrast continues as the snows fall on Liszt, but Alice sits inside by a fire. In other words the two are presented as personifying the fable of the Grasshopper and the Ant. I don’t know Japanese, but my guess is that “Alice” is a pun on the word “ant”, because “Ali Project” was originally known as “Ant Project”. In the fable, the grasshopper plays music all summer long, and ends up destitute, and begging the industrious ant for food in the winter. This episode alluded to the president in these terms several times. First when he discovered Ryoushi’s sniping skill (the narrator remarks that it is rare to see him working), and on the shopping trip, Ringo remarks that the president comes up with ideas and then never participates in carrying them out. Speaking of Ringo, I read some comments about the first episode that questioned why the Otogi Bank would accept Ryoushi. 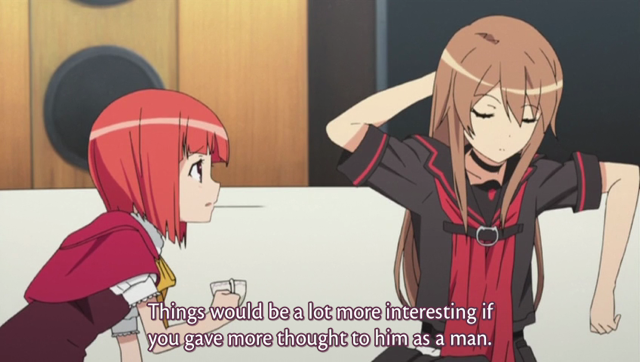 I think the answer, especially for Ringo, is clear: it gives them a new way to tease Ryouko. We were also introduced to some new characters, including the dogs shown at the top of this post. The dogs already proved useful both in making Ryoushi more useful (skill: tracking), and in breaking through Ryouki’s tsun-tsun exterior. 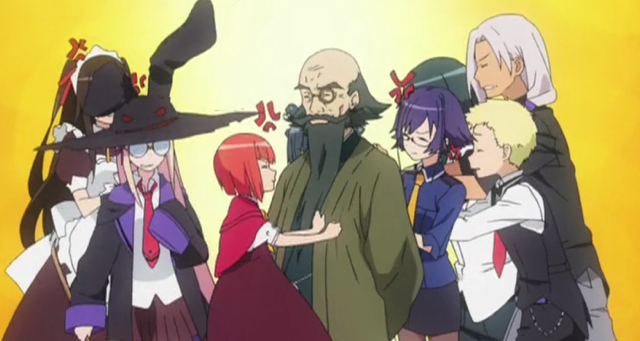 Another character that got mentioned in passing is the director of the school, named Aragami Lamp. Apparently he formed the Otogi Bank, and is a part the syndicate that “controls the city”. Where is this going? Is “Aragami Lamp” a reference to Aladin’s lamp? Does Otogi Bank’s connection to organized crime mean they are the bad guys? I don’t know. The level boss makes a cameo appearance. Finally, the series drops a hint about the conflict that might form the body of the season. We don’t know who this guy is, but we do know he is capable of mobilizing an army of delinquents to ambush our tsundere heroine. Does he have something against the Aragami Syndicate that bankrolls the Otogi Bank? Does he want revenge on the Otogi Bank for some past service they had rendered? Or did he target Ookami for some more personal reason? A lot of unanswered questions, but this is only the second episode. 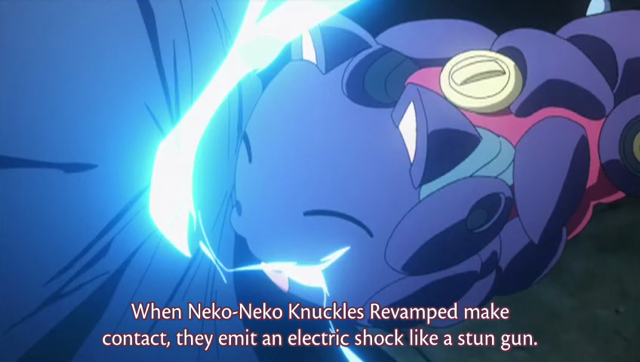 This was better than the first episode though the narrator still annoys me. 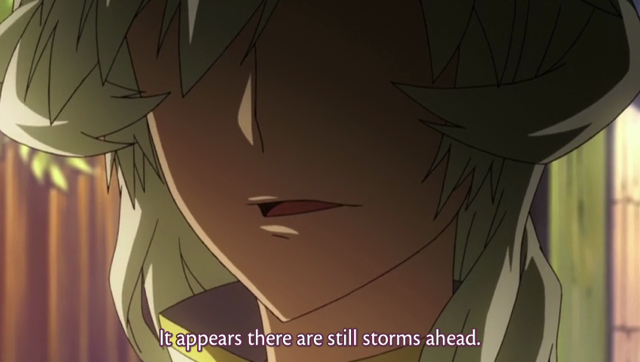 I’m starting to like Ryoushi as a character and hope he gets off his scopophobia by the end of this. Good catch on Liszt btw.